There’s a technique in screenwriting known as Preparation in Opposition. This is when you heighten an emotional moment or surprise by setting up the opposite. If you’re going to deliver bad news to the character, for example, make them happy. More importantly, set up the audience to believe good stuff is going to happen. Then the bad news is a greater shock. For example, in Children of Men (screenplay by Alfonso Cuaron & Timothy J. Sexton and David Arata and Mark Fergus & Hawk Otsby), there is a scene where our group of heroes is driving through the countryside. Theo and Julian are blowing a ping-pong ball back and forth, demonstrating a favorite trick, while the other passengers laugh. Theo and Julian are ex-spouses, and Julian admits she’s never been able to pull off the trick with anyone else. It looks like maybe the romance might be rekindled between them. And then the car is attacked by a gang and Julian is killed. We feel Theo’s devastation at the loss. Imagine if, instead of the playful beginning to the scene, the group in the car were discussing the danger of their mission immediately before the attack. Julian’s death would be much less shocking and Theo’s sense of loss less palpable. Another example comes at the end of Aliens (story by James Cameron and David Giler & Walter Hill, screenplay by James Cameron). Once the surviving heroes escape the planet and return to their ship, Ripley congratulates Bishop on a job well done – an important emotional moment since she hasn’t trusted him through most of the movie. And then we see acid dripping and BLAM – the mama alien’s tail pierces Bishop’s chest. This is actually a version of another preparation-in-opposition cliché – just when we think the killer is dead, they rise one last time. But it doesn’t feel cliché in Aliens because the resolution between Ripley and Bishop is genuinely wrapping up a subplot of the film. Also, the mama alien’s reappearance is planted earlier. When the drop ship is taking off, it gets tangled, giving the alien time to get aboard. The plant is not obvious at the time, but in retrospect it helps the surprise make sense. Too often in weak screenplays we see the surprises and twists coming a mile away. It’s understandable – for a surprise to be believable, after all, the elements need to be planted. But then it’s your job to convince the audience that something else is going to happen. The twist that the queen is still alive in Aliens works because we believe the scene is about something else entirely. The opposite works too – if you want a happy surprise, have the character give up hope. Before E.T. comes back to life in E.T. : The Extra Terrestrial (written by Melissa Mathison), Elliott and his siblings are given time to mourn his death. In fact, Elliott has just said his goodbyes when E.T.’s heart light comes on. Once again, effective planting helps make the surprise believable. The film has established that we don’t really understand E.T.’s physiology so we can believe that the scientists were wrong about his death, and we know that a message has been sent so the return of E.T.’s ship (which triggers his revival) is not surprising. The result is one of the greatest moments of joy in film history. Whiplash (written by Damien Chazelle) uses preparation-in-opposition a lot and quite masterfully. The first time Andrew attends studio band – after having been personally selected by Fletcher – he is given an opportunity to take his turn on the drums. The ultimate point of this scene is to show how abusive Fletcher is to his students. The culmination of the scene is when Fletcher rips Andrew apart, embarrassing him and making him cry. This is a crucial plot point, because Andrew will then have to decide whether to quit or accept the sadistic challenge of trying to please Fletcher. We have already seen earlier in the movie and even earlier in the same scene that Fletcher can be cruel and doesn’t suffer fools, so this is not an entirely unexpected climax to the scene. But Chazelle gives us a preparatory scene in the hallway where Fletcher finds a nervous Andrew and tells him to relax, asking him about his family, and assuring him that he doesn’t have anything to fear – after all, it’s only his first day and he was chosen for a reason. It works, giving Andrew confidence as they return to the classroom. Because of this, when Fletcher turns on Andrew it comes across as shocking and unexpected, even though we really shouldn’t be surprised. Moreover, Fletcher uses what he has just learned about Andrew’s family to insult him, revealing the whole pep talk in the hall was a set-up. Not only has Andrew been set up, so have we, the audience. It creates a strong emotional bond between Andrew and the viewer. This technique was used to create the shocking emotional twist at the end of Star Wars: The Force Awakens (written by Lawrence Kasdan & J.J. Abrams and Michael Arndt, based on characters created by George Lucas). Kylo Ren seems to be on the verge of turning from the dark side. He even asks his father for help. This is the culmination of a subplot running through much of the movie. We’ve seen Kylo Ren’s commitment waver before. When it turns out Kylo Ren is actually luring his father to his doom, the impact is heightened by our belief that Kylo Ren could be changing. When crafting your scenes, you don’t want the outcome to appear too obvious to the viewer. Whatever feeling you’re going to end on, try to set up the opposite expectation in the character and the audience. It will add dramatic and emotional power when the twist comes. 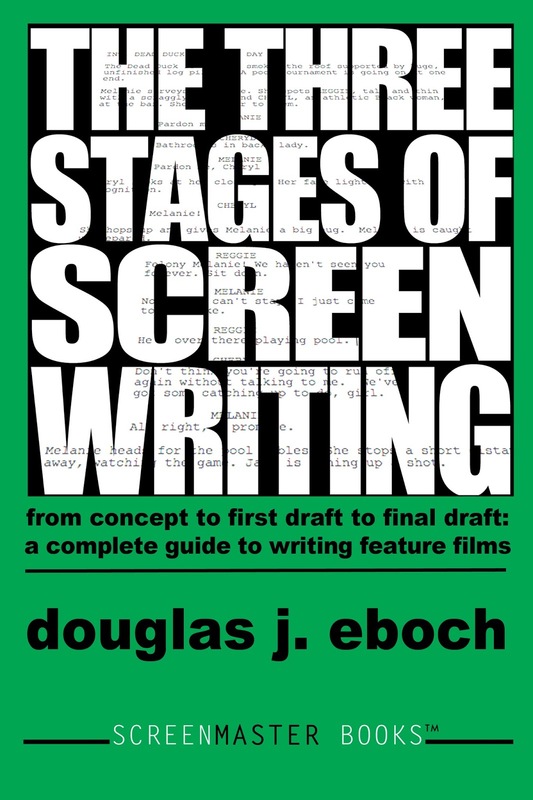 Learn more about preparation-in-opposition and other screenwriting techniques in my book The Three Stages of Screenwriting. This weekend I saw Eddie the Eagle (story by Simon Kelton, screenplay by Sean Macaulay and Simon Kelton) and was very disappointed. A big part of the reason I thought the movie didn’t work was the screenplay. When confronted with a movie like this, I think it’s important, as a professional screenwriter, to be able to analyze what went wrong and consider how I would have fixed those problems. Eddie the Eagle is based on the fantastic, heart-warming story of British ski jumper Eddie Edwards. These kinds of projects can be deceptively difficult. Since the true story is so good, it seems like all you have to do is put it into a proper structure, maybe heighten the obstacles, and you’re good to go. The trouble with this approach is that the audience already knows how the story ends. Granted, Eddie’s story may not be widely known (I remember him, but younger audiences wouldn’t). However, anyone buying a ticket will be going to the movie about the underdog ski jumper who made it to the Olympics. The marketing tells them how it came out. So the first mistake the movie made was that it tried to build suspense through act two as to whether Eddie would qualify for the Olympics. Let me illustrate the issue with another movie that had the same problem: Valkyrie (written by Christopher McQuarrie & Nathan Alexander). It was a true story about a plot by German officers to assassinate Hitler. However, everyone who knows even a little history knows that Hitler was not assassinated by German officers. The movie tried to build tension over whether the scheme would succeed – for example, there was a long sequence where we were supposed to be on the edge of our seat waiting to see if Hitler would stay in a room where a time bomb was set to go off. Except we already know he won’t, so the sequence came across as tedious instead of tense. When I came out of Valkyrie, my friend said it was like they tried to make a movie about the Titanic from the point of view of the Captain and whether he would hit the iceberg. Of course, the movie Titanic (written by James Cameron) was a gigantic success… but it wasn’t from the point of view of the Captain. The tension in Titanic was not whether the ship was going to sink – we all knew it would – it was a romance about whether lower class Jack and upper class Rose would end up together, with the fate of the ship used as a backdrop. So one technique to making a known story interesting is to focus on a different dramatic question than the outcome of the main historical event. In Valkyrie, the main character was an officer who knew from the first moments of the movie that Hitler was bad for Germany and wanted to get rid of him. The officer never wavered in that belief. But there was another officer who struggled with his loyalty to Germany. Could he betray his country by participating in a coup – even if the coup would ultimately be good for his country? What does patriotism really mean? I think an interesting movie could have been made about that character and his struggle. So getting back to Eddie the Eagle, in the second act, Eddie has to jump 61 meters to meet a newly imposed safety requirement to make the British Olympic team. He goes on the European ski jumping tour in a long sequence of practicing and competing, trying to make the distance. Practice and repeated attempts are probably the way he did it in real life, but it’s not that interesting on film, and it’s not tense since we know that eventually he will succeed. But the truth is, we know how most stories are going to come out – even fictional ones. In action movies, we know the hero will beat the bad guy. In romantic comedies we know the lovers will end up together – and in romantic tragedies, they won’t. What usually makes a story interesting is not whether the hero will win or lose, but how. 1. Focus more on the financial aspect. Skiing is an expensive sport and Eddie’s family is working class. There’s only the briefest nod to this when his father mentions they haven’t taken a vacation in three years, but it’s not treated as that significant a sacrifice. If Eddie’s father was shown to really struggle for every dollar, it would be plausible that he would resent his son’s spending so much on what the father thinks is a waste of time. 2. Eddie’s father could worry that his son will make a fool of himself, and want to protect his son (and himself) from ridicule. Maybe there could be a scene in the local pub where Eddie’s father hears people making jokes about his goofy son’s attempts to be an athlete. Then there would be some subtext if the father goes home and tells Eddie he should give up his silly pursuit. 3. Eddie’s father could be worried that his son will get hurt. Eddie had bad knees as a child and spent a lot of time in a hospital. It would be perfectly reasonable – and even sympathetic – if his father feared ski jumping was too dangerous a sport for his fragile son. I think any of these options would have been far more interesting and engaging than the one-note lout we’re given. When you find yourself writing a cliché, try to get deeper into the character. A believable character motivation can make the cliché seem fresh and unique. And when you see a bad movie, use it as an opportunity to learn how to make your own writing better.